There is one eternal God Waheguru, Who is creating, nourishing and destroying all, and Who is found through the prasaadh, through the grace of the sath, eternal Guru. Ba(n)dhanaa har ba(n)dhanaa. Guru Sahib Jee says ba(n)dhanaa, meaning to bow down. Guru Sahib Jee tells us Who we must bow down in front of in our life. If you're going to bow down to anyone, if you're going to surrender to anyone, if you're going to give up in front of anyone, then har ba(n)dhanaa, bow down to Waheguru. Externally, our mathha tek that we do, bowing down to Sri Guru Granth Sahib Jee Maharaj, is the physical embodiment of these words. We only bow to Sri Guru Granth Sahib Jee Maharaj, we only bow to our Guru Sahib Jee. Internally, how are we going to bow down to God? Gun gaavahu gopaal raae - sing the gun, the praises of gopaal, The nourisher of this world, raae - The King of all, Waheguru. The Guru of all Gurus, Sri Guru Granth Sahib Jee Maharaj. Those people who bow down to Waheguru, who follow what Sri Guru Granth Sahib Jee says, externally, physically carrying out the task of mathha tekna, of ba(n)dhanaa, of bowing down to The Guru, is a blessing as well. But internally as well, with our mind, accepting what The Guru says, trying to follow what The Guru says, that's the internal ba(n)dhanaa. Singing The Guru's praises, singing the praises of God, singing kirtan, listening to katha, listening to The Guru's Words, that is the way of bowing down mentally. It has to be on a spiritual, mental and physical level. 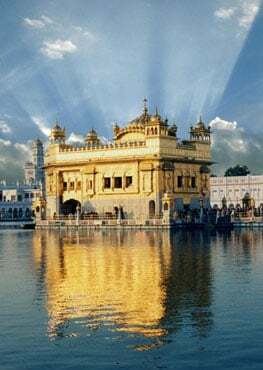 Ba(n)dhanaa - those people that bow down to Waheguru, har ba(n)dhanaa, har, all of their ba(n)dhanaa meaning cages or prisons, physical and also spiritual. Physically as we can see Sri Guru Hargobind Singh Jee Maharaj, Bandi Chorr Paatshah, The Sixth Nanak, when they freed the 52 kings from the jail of Gwalior, physically when the kings bow down to God, when they accepted The Guru's words, The Guru was there to liberate them. Spiritually also we are entangled in the cage. Ba(n)dhanaa can also mean a cage, a prison. We're in the prison of kaam, krodh, lobh, moh, ahanakaar. However, Guru Sahib Jee can har this, har also means to destroy. Har can also mean all. So, all of our internal prisons of kaam, krodh, lobh, moh and ahangkaar, The Guru can destroy these and free us, liberate us, physically and spiritually. So, guramukh piaareyo, Guru Sahib Jee is telling us, physically, mentally, spiritually, bow down to The Guru, The Guru will take away all of the obstacles in your path. Guru Sahib Jee is telling us, don't just do it physically, also mentally and spiritually, gun gaavahu gopaal raae - sing the gun, the praises of That Waheguru, of That Lord God. Do not make it an empty ritual, along with the physical act, have the mental submission, the spiritual submission to The Lord. Rehaao - Guru Jee says pause and think about this. Only those people who have vaddai bhaag, who have great fortune, bhaettae - meet with guradhaevaa, the most divine Guru, Sri Guru Granth Sahib Jee. Kott - millions of billions of paraadh, of evil sins, mittae - are eradicated, they are washed away, har saevaa - by serving The Lord. If you carry out the selfless service of The Lord, of Waheguru, then millions of your sins are washed away. That jan, that humble servant of God, is not biaapai, is not afflicted by the agan, by the fire of sog - sorrow. Why is sog like a fire? Because it burns us away. However, that blessed being is saved from this. how can we cross across this world? Saagar - this ocean of the world, thariaa - you can cross over this, saadhhoo sa(n)gae - if you stay in the company of the saadhhoos, of those great gursikhs who meditate upon The Guru. What do you do when you sit down in the company of the saadhsangat, with these great gursikhs? You japahu, you meditate upon The Naam, The Name of that nirabho, that fearless Lord God. Japahu, meditate upon it, har ra(n)gae - within you, the ra(n)gae, the love of God will sprout. The jam ja(n)dhaar, the messengers of death n aavai naerrae, cannot even come naerrae, cannot even come close to that person. What does this mean? Yes, that person dies physically like everyone else, but spiritually, they live on forever, they cannot be touched. for that person who has bowed down to The Lord, who meditates upon The Guru's charan, upon The Guru's lotus feet, who stays away from the materials of others, the material goods of others, stays away from sins, thrisanaa agan prabh aap bujhaaee. Waheguru Jee aap, themselves, bujhaaee - remove the agan - the fire of desire from within that person. Sathiguru Arjun Sahib Jee says that if you want to be oudhharae, if you want to be liberated, come into the saranaaee, come into the protection of The God. When you enter into the protection of God, you will be liberated.